The key to documenting the effectiveness of foot orthoses for patellofemoral pain syndrome appears to be identifying which specific subgroup of PFPS patients are most likely to benefit. Evidence-based clinical prediction rules offer guidance for optimizing clinical outcomes. First line treatment generally consists of physical therapy and home exercises to strengthen the quadriceps and hip musculature.26,27 In addition to physical therapy, many adjunctive treatments have been proposed to be effective in the management of PFPS. One of these adjunctive interventions is the prescription of foot orthoses designed to control excessive subtalar joint pronation. Traditionally, foot orthoses have been prescribed to individuals with PFPS to control any excessive foot pronation that may be present. Tiberio25 proposed that excessive foot pronation would lead to greater tibial and femoral internal rotation as a result of joint coupling. In turn, this would lead to greater dynamic knee valgus and greater stress on the lateral patellofemoral joint.25 Foot orthoses designed to control excessive foot pronation are thought to prevent this sequence and thereby reduce pain in individuals with PFPS. In a recent systematic review, we established level I evidence for foot orthoses prescription when treating individuals with PFPS,28 identifying one high quality randomised controlled trial by Collins et al.26 Specifically, there were significantly more self-reported improvers at six weeks in a group receiving prefabricated foot orthoses compared to a group receiving a control intervention (flat inserts).26 The number needed to treat for one additional improver in the foot orthoses group from this study was calculated to be four. Considering the inexpensive nature of the prefabricated orthoses provided in this study,26 these are promising findings for the efficacy of foot orthoses when treating individuals with PFPS. Despite the positive clinical outcomes produced by foot orthoses prescription in the Collins et al study,26 it should be noted that these were only seen in the short term (six weeks). Longer term follow up (at 12 and 52 weeks) indicated no significant difference in outcomes between the group receiving prefabricated foot orthoses and the group receiving a placebo (flat inserts).26 However, no attempt was made by Collins et al to recruit those most likely to benefit from foot orthoses. 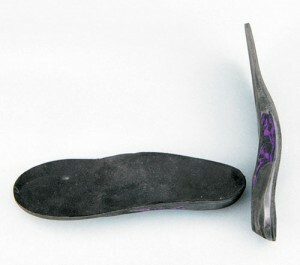 Additionally, only one form of foot orthoses (prefabricated) was used. In reality, this is unlikely to reflect clinical practice, where foot orthoses are prescribed for certain individuals and are frequently customised. Therefore, Collins et al’s findings26 may underestimate the potential benefits of foot orthoses prescription. This possibility requires further research. Comparison between the efficacy of prescribing prefabricated (“off the shelf”) foot orthoses and cast molded customized foot orthoses was an area of research identified in the review that needs to be addressed.28 This choice requires two major considerations: establishing the need to customize the orthotic device to match the individual’s foot type; and affordability of the device, given that customized devices are substantially more expensive than prefabricated devices. A number of lower quality studies29-34 support both prefabricated and customized foot orthoses.28 However, there is currently a paucity of research comparing the efficacy or cost-effectiveness between these two prescription approaches.28 Until this area of research is addressed, the decision should be made jointly between the patient and the clinician, taking into account both clinical judgement and cost implications. One vital consideration regarding foot orthoses prescription to individuals with PFPS is who should and should not receive them. It is clear both anecdotally and in research evidence that not all individuals with PFPS benefit equally from foot orthoses prescription. Previous research from two separate studies26,34 indicates that when individuals with PFPS are prescribed prefabricated foot orthoses, between 25% and 40% will report marked improvement at 12 weeks. Additionally, between 18% and 33% will report no improvement, or worsening of their condition at 12 weeks.26,34 These findings highlight the variability in outcomes following foot orthoses prescription, and the need to identify those most likely to benefit in order to optimize treatment outcomes. Inconsistent findings regarding the ability of clinical measures of foot type to predict foot orthoses outcomes in individuals with PFPS29,35,36 suggests that their value in a clinical setting may be limited. However, one vital consideration is that none of these studies evaluated foot pronation dynamically during a functional activity. Considering this, we evaluated the relationship between static foot posture, measured using the FPI, and peak angular motions associated with foot pronation during walking in a group of 26 individuals with PFPS. Unpublished results from this study indicated the FPI was only moderately associated with peak forefoot abduction, predicting about 25% of its variance. Additionally, there were no associations between the FPI and either peak forefoot dorsiflexion or peak rearfoot eversion. We then evaluated the predictive value of kinematics at the rearfoot and forefoot associated with foot pronation during walking in a group of 26 individuals with PFPS.37 Our findings indicated that greater dynamic peak rearfoot eversion relative to the floor was predictive of marked improvement 12 weeks following prefabricated foot orthoses prescription. Interestingly, the 26 participants from this study were a sub-population of our larger study of 60 participants,35 where measures of foot posture and mobility were unable to predict marked improvement. This would indicate that basing foot orthoses prescription on dynamic evaluation of foot function (i.e. rearfoot eversion relative to the floor) is more appropriate than static clinical measures of foot type. 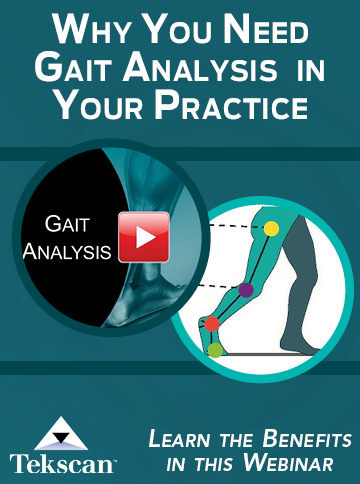 Until validated clinical measures of dynamic foot function are established, the clinician should rely of visual observation and use of video analysis to assist this. Of the four variables identified in our clinical prediction rule, the prediction test with the greatest accuracy was the immediate change in pain during the completion of a single leg squat. If pain was reduced immediately by the foot orthoses, the likelihood of marked improvement increased from 25% to 45%. This finding highlights an important concept when considering the appropriateness of foot orthoses prescription for individuals with PFPS: immediate improvement in functional performance enhances the likelihood of positive longer term outcomes. 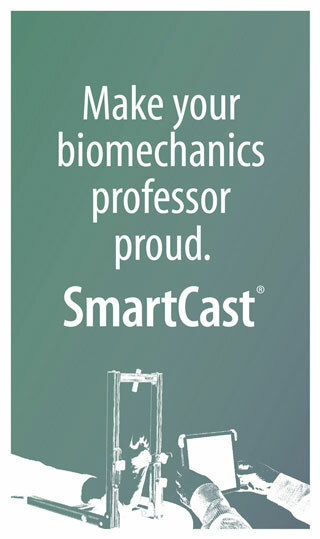 Supporting this concept, our group also has unpublished data indicating that two additional functional performance measures are predictive of marked improvement with foot orthoses in individuals with PFPS: improved ease of completing a single leg squat (i.e., they found it easier to balance), and an increase in the number of pain-free step downs from a 20-cm high step at a rate of 48 steps per minute. Evaluating functional performance measures to guide decisions related to foot orthoses prescription is not a new theoretical concept. Vicenzino38 proposed the use of the “treatment direction test” (TDT) to identify individuals most likely to benefit from foot orthoses prescription. The basis of the TDT is to use an external control (e.g., adhesive strapping tape or temporary orthoses) to facilitate the desired motion control (e.g., reduce foot pronation in individuals with PFPS). Pain and quality of movement are assessed with and without this external control. If the external control produces a significant improvement, both patient and clinician can be confident that prescribing foot orthoses is likely to be effective.38 This same approach may be particularly useful in PFPS patients where symptoms often cannot be reproduced in a clinical setting using tests such as a single leg squat. For example, a runner demonstrating signs of excessive foot pronation may report pain onset after 5 km but is otherwise symptom-free. In this case, external control such as applying adhesive tape to control foot pronation (i.e. mimic foot orthoses control) may be implemented, and distance to pain onset re-evaluated. If it is significantly improved (e.g., 10 km or no pain at all), then foot orthoses would be prescribed. Considering our recent findings, and its clinical applicability, use of the TDT concept is recommended when considering foot orthoses prescription for individuals with PFPS. 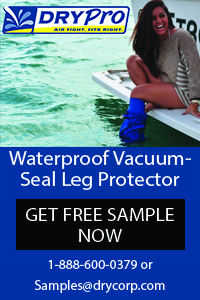 Footwear is one potential extrinsic risk factor for the development of PFPS. Interestingly, our clinical prediction rule indicated that footwear with reduced motion control properties (i.e., less supportive) was predictive of marked improvement 12 weeks following foot orthoses prescription. As well as providing a potential predictor, this is an interesting finding for two reasons: (i) poor footwear may have led to the development of PFPS in these individuals since improving support resulted in symptom reduction; and (ii) encouraging an individual to wear more supportive footwear may also lead to therapeutic benefits similar to that provided by the foot orthoses. Although both points require further research to establish their validity, these results still highlight the importance of considering footwear when treating individuals with PFPS, and in particular when considering foot orthoses prescription. Current evidence indicates foot orthoses may be an effective intervention for individuals with PFPS in the short term. With a lack of current evidence to support the superiority of either prefabricated or custom prescription, choice should be made on an individual basis, considering the potential benefit of customization versus the greater affordability of a prefabricated device. The presence of excessive rearfoot eversion during dynamic function, and immediate improvements in functional performance with a temporary device will increase the likelihood of improvement in individuals with PFPS. Christian J. Barton, BPhysio(Hons), is a PhD candidate at the Musculoskeletal Research Centre at La Trobe University in Bundoora, Australia, and research supervisor at the Centre for Sports and Exercise Medicine at Queen Mary University of London, UK. Acknowledgement: Thank you for the assistance and guidance provided by a number of individuals with research reported in this paper, including A/Prof Hylton Menz, Dr. Kay Crossley, Dr. Pazit Levinger, and Dr. Kate Webster. 1. Devereaux MD, Lachmann SM. Patello-femoral arthralgia in athletes attending a Sports Injury Clinic. Br J Sports Med 1984;18(1):18-21. 2. Nimon G, Murray D, Sandow M, Goodfellow J. Natural history of anterior knee pain: a 14- to 20-year follow-up of nonoperative management. J Pediatr Orthop 1998;18(1):118-122. 3. Stathopulu E, Baildam E. Anterior knee pain: a long-term follow-up. Rheumatology 2003;42(2):380-382. 4. Feller JA, Amis AA, Andrish JT, et al. Surgical biomechanics of the patellofemoral joint. Arthroscopy 2007;23(5):542-553. 5. Heino Brechter J, Powers CM. Patellofemoral joint stress during walking in persons with and without patellofemoral pain. Med Sci Sports Exerc 2002;34(10):1582-1593. 6. Brechter JH, Powers CM. Patellofemoral joint stress during stair ascent and descent in persons with and without patellofemoral pain. Gait Posture 2002;16(2):115-123. 7. Davis IS, Powers CM. Patellofemoral pain syndrome: proximal, distal, and local factors, an international retreat, April 30-May 2, 2009, Fells Point, Baltimore, MD. J Orthop Sports Phys Ther 2010;40(3):A1-A16. 8. Cowan SM, Bennell KL, Crossley KM, et al. Physical therapy alters recruitment of the vasti in patellofemoral pain syndrome. Med Sci Sports Exerc 2002;34(6):1879-1885. 9. Cowan SM, Hodges PW, Bennell KL, Crossley KM. Altered vastii recruitment when people with patellofemoral pain syndrome complete a postural task. Arch Phys Med Rehabil 2002;83(7):989-995. 10. Elias JJ, Kilambi S, Goerke DR, Cosgarea AJ. Improving vastus medialis obliquus function reduces pressure applied to lateral patellofemoral cartilage. J Orthop Res 2009;27(5):578-583. 11. Van Tiggelen D, Cowan S, Coorevits P, et al. Delayed vastus medialis obliquus to vastus lateralis onset timing contributed to the development of patellofemoral pain in previously healthy men. Am J Sports Med 2009;37(6):1099-1105. 12. Witvrouw E, Lysens R, Bellemans J, et al. Intrinsic risk factors for the development of anterior knee pain in an athletic population. A two-year prospective study. Am J Sports Med 2000;28(4):480-489. 13. Ireland ML, Willson JD, Ballantyne BT, Davis IM. Hip strength in females with and without patellofemoral pain. J Orthop Sports Phys Ther 2003;33(11):671-676. 14. Bolgla LA, Malone TR, Umberger BR, Uhl TL. Hip strength and hip and knee kinematics during stair descent in females with and without patellofemoral pain syndrome. J Orthop Sports Phys Ther 2008;38(1):12-18. 15. Cichanowski HR, Schmitt JS, Johnson RJ, Niemuth PE. Hip strength in collegiate female athletes with patellofemoral pain. Med Sci Sports Exerc 2007;39(8):1227-1232. 16. Piva SR, Goodnite EA, Childs JD.Strength around the hip and flexibility of soft tissues in individuals with and without patellofemoral pain syndrome. J Orthop Sports Phys Ther 2005;35(12):793-801. 17. Souza RB, Powers CM. Differences in hip kinematics, muscle strength, and muscle activation between subjects with and without patellofemoral pain. J Orthop Sports Phys Ther 2009;39(1):12-19. 18. Cowan SM, Crossley KM, Bennell KL. Altered hip and trunk muscle function in individuals with patellofemoral pain. Br J Sports Med 2009;43(8):584-588. 19. Brindle TJ, Mattacola C, McCrory J. Electromyographic changes in the gluteus medius during stair ascent and descent in subjects with anterior knee pain. 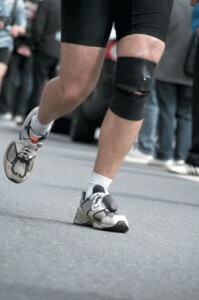 Knee Surg Sports Traumatol Arthrosc 2003;11(4):244-251. 20. Willson JD, Davis IS. Lower extremity mechanics of females with and without patellofemoral pain across activities with progressively greater task demands. Clin Biomech 2008;23(2):203-211. 21. Dierks TA, Manal KT, Hamill J, Davis IS. Proximal and distal influences on hip and knee kinematics in runners with patellofemoral pain during a prolonged run. J Orthop Sports Phys Ther 2008;38(8):448-456. 22. Powers CM, Ward SR, Fredericson M, et al. Patellofemoral kinematics during weight-bearing and non-weight-bearing knee extension in persons with lateral subluxation of the patella: a preliminary study. J Orthop Sports Phys Ther 2003;33(11):677-685. 23. Lee TQ, Morris G, Csintalan RP. The influence of tibial and femoral rotation on patellofemoral contact area and pressure. J Orthop Sports Phys Ther 2003;33(11):686-693. 24. Boling MC, Padua DA, Marshall SW, et al. A prospective investigation of biomechanical risk factors for patellofemoral pain syndrome: the Joint Undertaking to Monitor and Prevent ACL Injury (JUMP-ACL) cohort. Am J Sports Med 2009;37(11):2108-2116. 25. Tiberio D. The effect of excessive subtalar joint pronation on patellofemoral mechanics: a theoretical model. J Orthop Sports Phys Ther 1987;9(4):160-165. 26. Collins N, Crossley K, Beller E, et al. Foot orthoses and physiotherapy in the treatment of patellofemoral pain syndrome: randomised clinical trial. BMJ 2008;337:a1735. 27. Crossley K, Bennell K, Green S, et al. Physical therapy for patellofemoral pain: a randomized, double-blinded, placebo-controlled trial. Am J Sports Med 2002;30(6):857-865. 28. Barton CJ, Munteanu SE, Menz HB, Crossley KM. The efficacy of foot orthoses in the treatment of individuals with patellofemoral pain syndrome: a systematic review. Sports Med 2010;40(5):377-395. 29. Sutlive TG, Mitchell SD, Maxfield SN, et al. Identification of individuals with patellofemoral pain whose symptoms improved after a combined program of foot orthosis use and modified activity: a preliminary investigation. Phys Ther 2004;84(1):49-61. 30. Johnston LB, Gross MT. Effects of foot orthoses on quality of life for individuals with patellofemoral pain syndrome. J Orthop Sports Phys Ther 2004;34(8):440-448. 31. Amell TK, Stothart JP, Kumar S. The effectiveness of functional foot orthoses as a treatment for patellofemoral stress syndrome: The client’s perspective. Physiother Can 2000;52(2):153-157. 32. Pitman D, Jack D. A clinical investigation to determine the effectiveness of functional foot orthoses as initial treatment for patellofemoral pain syndrome. J Prosth Orthot 2000;12(4):110-116. 35. Crossley KM, Barton CJ, Menz HB. Clinical predictors of foot orthoses efficacy in patellofemoral pain syndrome. Med Sci Sports Exerc 2010;42(suppl 5):Abstract 2611:S485. 36. Vicenzino B, Collins N, Cleland J, McPoil T. A clinical prediction rule for identifying patients with patellofemoral pain who are likely to benefit from foot orthoses: a preliminary determination. Br J Sports Med 2010;44(12):862-866. 38. Vicenzino B. Foot orthotics in the treatment of lower limb conditions: a musculoskeletal physiotherapy perspective. Man Ther 2004;9(4):185-196. Beautiful paper. I was surprised to see excessive calcaneal eversion predicted success with orthotic intervention as it correlates so poorly with three-dimensional movement. Would have been nice if the authors used William and McClay’s arch height ratio, as it more accurately predicts three dimensional movement patterns. I’d love to see some of the unpublished research they referred to in print soon.